今年東森新人王繼續以歌唱比賽的方式，尋找具有潛力的明日之星，並結合中、港、台三地知名實力派藝人的演唱會，讓新人王決賽晉級者有機會與其同台演唱，體驗巨星級的舞台演出，並且獲得演唱會觀眾立即的關注，成為媒體報導的焦點 。今年東森新人王也會繼續邀請亞洲知名唱片公司製作人擔任決賽評審，讓今年參加新人王的年輕朋友們，擁有被唱片公司簽約的機會，並朝歌手藝人的目標邁進。 ETTV America has been affiliated with the local communities for the past 8 years. Not only have we brought the latest news coverage, we have held meaningful community events focused on promoting cultural understanding and family entertainment. The annual Top Idol event, a talent search contest, is one of our most reputable events. We have had people coming from across the United States and overseas to participate in Top Idol since its debut in 2003. The slogan “dong sen xin ren wang, deng ni lai chen wang” has made a powerful impression on our audience. 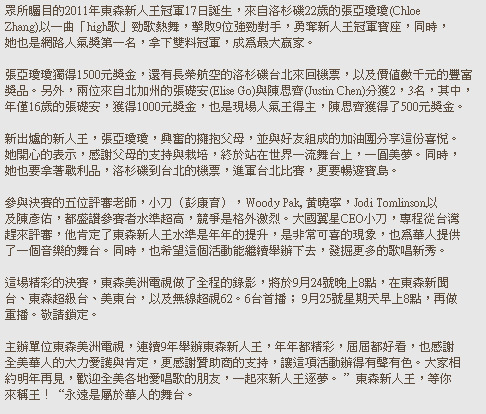 Some of the U.S. champions had even gone to Taiwan and Asia for competitions for the international championship title, and received label contracts in the entertainment industry. 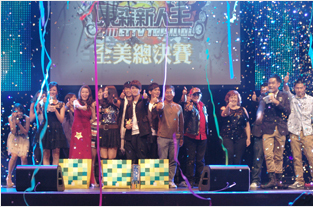 The Top Idol event for 2011 will continue to be a singing contest to discover potential pop stars of tomorrow. The Top Idol event is collaborating with Taiwanese sensation rock singer. Finalists will have a chance to be performing at the concert followed by the final round of Top Idol. ETTV is also inviting well-known record producers from Asia to be one of the professional judges, giving contestants the opportunity of being signed by a respectable label company. Copyright 2003-2011 ETTV AMERICA CORP. All Right Reserved.